The DLRO-H200 is designed to measure the resistance of circuit breaker contacts, bus-bar joints and other high-current links. This product is designed with safety, ease of use and versatility in mind. 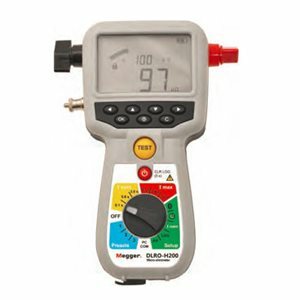 This Micro-ohmmeter can be used anywhere to measure a low resistance value with high accuracy. With DLRO-H200 it is possible to make measurements according to the DualGround™ method. This means that the test object will be grounded on both sides throughout the test giving a safer, faster and easier workflow. Ruggedness and light weight make the handheld DLRO-H200 very suitable for field work, in substations and similar locations. The unit comes with a strong rubber holster that makes it extra durable. The DLRO-H200 is designed to carry out a full day of testing without recharge. It can store 190 test values and transfer test data to a PC via Bluetooth. The Bluetooth feature can also be used in conjunction with the wireless headset (supplied) to provide an audible pass/fail signal against user adjustable limits as tests are performed. DLRO-H200 Micro-ohmmeters are supplied as standard with a copy of the PowerDB Lite software package. This intuitive software offers powerful features for storing, analyzing and archiving test results, and it supports reporting a wide range of industry standard formats. It also makes it easy to integrate results from the DLRO-H200 with results from other instruments to produce uniform reports.